The liver is the metabolic centre for the body, responsible for the processing of much of the body’s metabolic waste. The liver processes this through two main mechanisms, known as phase 1and phase 2 detoxification. Modern lifestyle choices can force the liver to work hard; and nutritional support may be beneficial for it to function optimally. - Helps the liver flush out toxins. Bulking Agents (di-calcium phosphate, microcrystalline cellulose), L-Cysteine, L-Glutamine, L-Methionine, Choline Citrate, Dandelion Root (Taraxacum officinalis), Inositol, Artichoke Leaf Powder, Standardised Milk Thistle Extract, Curcumin Extract, Anti-caking agents (veg. magnesium stearate, veg. stearic acid, silicon dioxide), Beta Carotene, Glazing Agent (opadry clear), Niacin (nicotinamide), Pantothenic Acid (calcium pantothenate), Vitamin B6 (pyridoxine HCL), Riboflavin (vitamin B2), Thiamin HCL (vitamin B1), Folic Acid, Vitamin B12 (cyanocobalamin). Adults and children over 16 years of age, two tablets daily.Do not exceed recommended daily intake unless advised by a suitably qualified person.Food Supplements should not be used as a substitute for a varied diet. Please seek professional advice before taking this supplement if you are pregnant or likely to become pregnant, and/or if you are on prescribed medication. 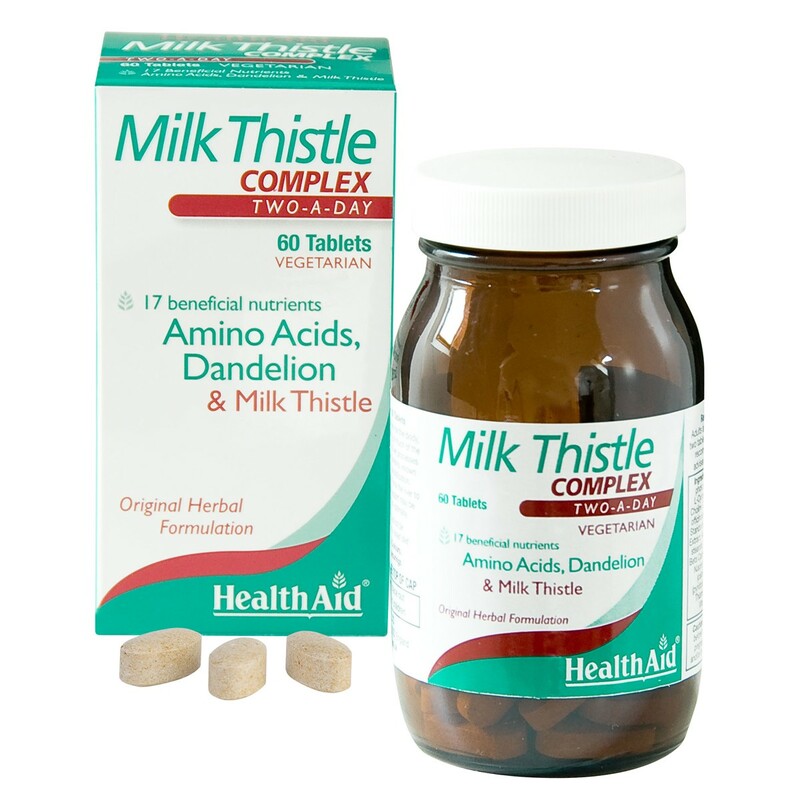 Thank you for your interest in HealthAid Milk Thistle Complex. Enter your email and we'll contact you as soon as it's available again.